Zenit Kazan’s Maxim Mikhailov was named the MVP of the 2018 Men’s European Champions League Final 4, making him one of three players from the Russian Champions to be named to the 8-player Dream Team after the match. 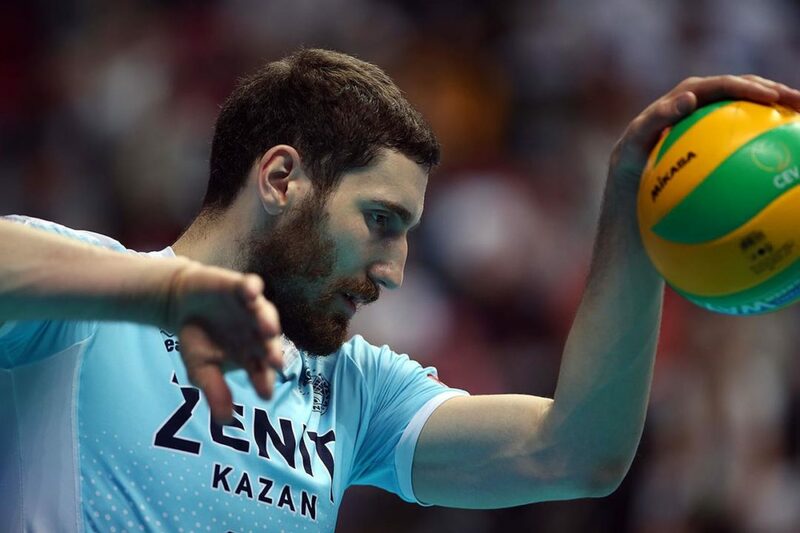 Mikhailov was a star on a team full of stars as Zenit Kazan won their 4th-straight, and 6th-overall, Champions League title – more than anybody else has won this millennium (and second-most of all-time). The honor, technically given on just the strength of the four matches of the Final Four tournament, must have been down to two Kazan stars. Wilfredo Leon, who has officially departed the team for Perugia, led all players in the final with 51 points, while Maxim Mikhailov was 4th with 42 points. On the balance, only two differences can be pointed to: Mikhailov is a Russian, with the favor going to the home-nation player; or their relative performance in the championship game, where Leon scored the winning point (including a finishing ace) in each of the 3 sets that Kazan in the 3-2 nail-biter, but Mikhailov played the better match from start-to-finish. Leon wound up out-hitting Mikhailov 57%-49%, but had 6 more hitting errors, and did most of his damage in the later stages of the game. Leon also finished the match with 32 points to 24 for Mikhailov. Based on numbers alone, Leon seems to have an advantage. Based on the eye-test, Leon certainly was the dominant force in the semi-final, and then again in crunch-time in the final. On emotion, Leon was the overwhelming factor for his team in key moments. But, as we saw in the women’s Champions League, FIVB seems to be weighing criteria that is not obvious to the rest of us. Their teammate Alexander Butko joined them on the Dream Team. From the silver-medalists Lube Civitanova, outside hitter Osmany Juantorena, opposite Tsvetan Sokolov, and middle blocker Dragan Stankovic, who controlled the first two sets of the gold medal match almost single-handedly, are also on the team. Civitanova’s libero Jenia Grebennikov, who had 20% perfect and 33% positive reception in the championship game (which was not the top among his own team, let alone the two participating liberos), takes the defensive spot, giving Civitanova more representatives (4) than the champions Kazan (3). The bronze medalists Sir Safety Perugia are represented by middle blocker Marko Podrascanin, who led the whole competition with 32 blocks, including 7 in his two matches of the Final 4. 4th-place finishers Zaksa were shut out of the team. See the full roster below, plus a video highlighting each player’s credentials.